Ruth Jane (McGee) Fraker passed away at Mercy Hospital in Redding on June 21, 2018 from complications of a stroke. Mom was born January 12, 1920 to William and Mary McGee in Beaverton, Oregon. She was 98 1⁄2 years young when she passed. She was the oldest of six and grew up during the depression so she could be “thrifty” when she wanted! 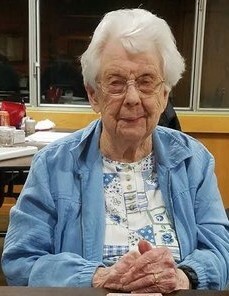 She married Earl Fraker on April 19, 1941 in South Bend, Oregon and they had three children, Jack (Nelda) Fraker, Mary Salyer and Pat Krebs (Ted Johnson). She is also survived by grandchidren Dawn McCombs, Nancy Saylor (Jon), Raymond Fraker (Carol) and Willie Bridges (Debbie). 9 great grandchildren: Jeanette Charley, Audrey McCombs, Mitchell McCombs, Coltrane Fraker, Alyssa Fraker, Ariel Upton, Hannah Weinberger, Sarah Anderson and Sara McAllister.4 great great grandchildren: Ruben and Mahalia Espinoza and Estella and Warrick Weinberger – Yes, that makes five generations! She also is survived by her sister Elizabeth Dixon. She was preceded in death by her parents, husband Earl and grandson Michael Bridges and grandaughter Kelly McCallister, brothers Tom, Marion (Sam) and Jim and sister Pat, all of her sisters-in-laws as well as all of Dad’s family. There will be a funeral service on July 28th, 2018 at 2 p.m. at Christ the King Catholic Church, 1941 McKinleyville Avenue, McKinleyville. There will be a rosary at 1:30 for those who would like to attend and there will be a reception after the funeral at the church.